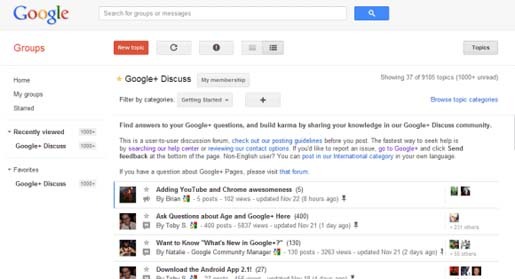 During 2009, most of the Google discussion groups were moved from Google Groups to a new platform called "Google Help Forums". After two years, the time has come again for them to be moved again to Google Groups. As Google+ and Chromebooks Central already use the new platform, you can find the upcoming forums. Read out the following. "Over the next several months, we'll be migrating our 250+ help forums in 20+ languages to the new Google Product Forums platform. Built on the new Google Groups, Google Product Forums provide users with a fresh interface and robust features for asking questions and discussing our products. The new platform brings some exciting new features to our forums. For example, you can now select between starting a discussion or asking a question, quickly indicate your own interest in a question that has been asked by voting 'Me too!,' and easily share a topic with your circles on Google+," explains Google.